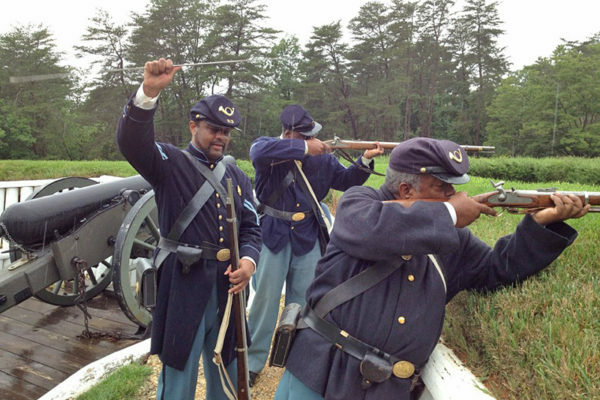 Reenactors from the 54th Massachusetts Volunteer Infantry, Co. B., and the 23rd U.S.C.T. will stage a military encampment that portrays the history, training and soldier life of African American units associated with the Civil War Defenses of Washington. Visitors will learn about the role of the U.S.C.T. in the Union war effort, and about specific units that were trained and stationed in the local area. Historical figures such as Medal of Honor recipient Sgt. Major Christian Fleetwood of the 4th U.S.C.T., a Washington resident and civic leader after the war, will be portrayed. The program is free, and is weather dependent.